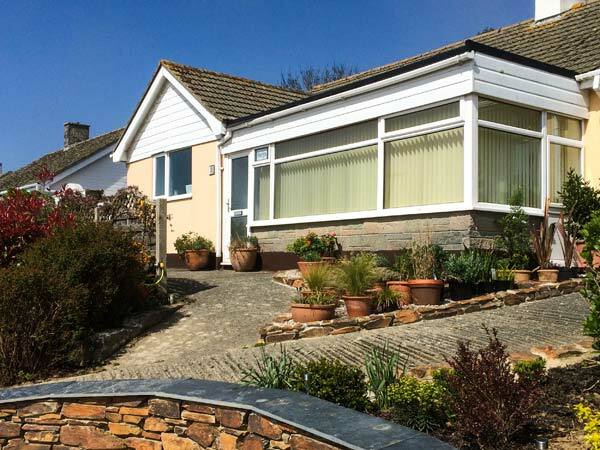 Harlyn is a homely, single-storey cottage located on the edge of Mevagissey in Cornwall. With three bedrooms including two doubles, one with an en-suite bathroom, plus one single, this cottage can sleep five people. There is also a family bathroom, a kitchen, a sitting room as well as a conservatory and a sun room. Outside is off road parking for one car plus an enclosed lawned garden with furniture. Harlyn offers friends and families a cosy base from which to explore this beautiful, varied area of Cornwall. Electric storage heaters with electric fire. Electric oven and hob, microwave, fridge, freezer, washing machine, dishwasher, TV with FreeSat, DVD, WiFi, selection of books, games and DVDs. Fuel and power inc. in rent. Bed linen and towels inc. in rent. Off road parking for 2 cars. Enclosed garden with summer house and garden furniture. Two well-behaved dogs welcome. Sorry, no smoking. Shop and pub 10 mins walk with uphill return.